Ever wondered what it would be like to be a Graveyard Keeper in medieval times? Me neither. 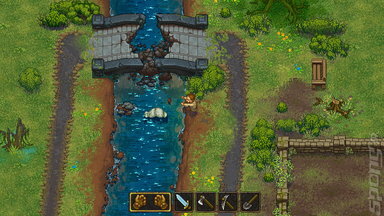 Despite our apathy towards experiencing such a profession in what can only be described in very dark times, Lazy Bear Studios has seen fit to make Graveyard Keeper. This is a game that places the player in the unenviable role of the keeper of graves in a town that is beset by supernatural occurrences that you, as the keeper, must avoid or indeed overcome in order to keep living. 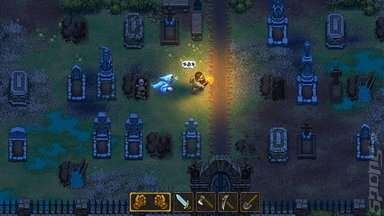 So Graveyard Keeper is a survival game that features a lot of building mechanics that centre on the disposal of dead bodies. Celebrating the mundane is at the heart of Graveyard Keeper. It plays into the concept of, rather than going on adventures seeking fortune, the player acts as a cleanup crew to the piles of bodies left in a hero's wake as they make their way across the land (apparently) saving it. Success is measured against still being alive and having enough money to buy a pint of ale at the end of the week. These problematic bodies can be harvested for resources such as blood and organs, some of which the locals may have a use for. If there's a market for it then you can exploit it. Yes, there are some ethical issues here, but these people are dead right? It's not as if they're going to need that spleen now is it? I played an early version of Graveyard Keeper at PAX West 2017, which was being shown off at TinyBuilds' impressive booth there. I was taken by how I empathised with the lot of the main protagonist. He is just trying to make his way in life by exploiting the plight of those who no longer have one. A pragmatist in the extreme, he will get as much as he can from the cadavers he gathers before they are either buried or burnt and he takes no comfort in knowing that deep down ethically things are a bit vague for him. 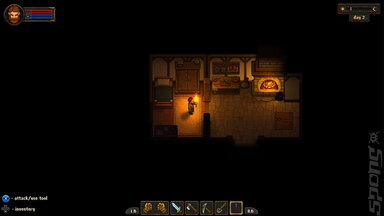 With Graveyard Keeper being a survival builder in a similar mold to Minecraft there is a need to build things from resources gathered by the player. The strength here is that the principal resource is the dead bodies the player is provided with by the local townsfolk. This provides a focus to the player that other survivor builders fall foul of as there is a risk of there being too many resources to draw from and too many items to make. This restriction was actually liberating for me while I played through the initial area of Graveyard Keeper as it allowed me to make very linear choices as to what to do next. If you take a look at the screenshots that litter this preview you'll see how Graveyard Keeper resembles a SNES or Megadrive game. Don't let that fool you, as once you see it moving it is far removed from those 16 bit platforms as it's free from flickering and is very fluid in its animation. The depth of colour is far greater than any of those old machines could hope to produce. I really enjoyed playing Graveyard Keeper and am looking forward to its release on Xbox One and Windows PC next year. Posting of new comments is now locked for this page.